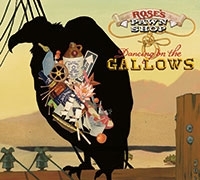 Dancing on the Gallows, the second album from California indie outfit, Rose’s Pawn Shop has been at your station for a little while and we can tell you’re all loving it. Thanks to those of you that helped Dancing on the Gallows debut on the CMJ Top 200 last week. The group has been on a breakneck tour but stopped long enough to do an in-studio performance at KEXP in Seattle. Listen to the whole performance or a few select songs here. Let us know if you are interested in interviews, station visits or checking out one of the shows listed below.